South and North Koreas have held a groundbreaking ceremony for a project to reconnect the North’s railways and roads to the South, even though construction cannot begin due to the sanctions imposed on Pyongyang by the United Nations (UN). Some 100 officials, politicians, and members of families from South Korea arrived on board a special train for the ceremony in the North Korean border town of Kaesong on Wednesday, according to a South Korean Unification Ministry spokesman. A 100-strong North Korean delegation also joined them along with officials from the UN, China, Russia, and Mongolia. South Korea said it had received an exemption to sanctions from the UN Security Council to proceed with the ceremony as it involved the usage of South Korean transport vehicles and goods. It also said the Security Council and the US had both supported the ceremony. But construction work is impeded by sanctions over North Korea’s missile and nuclear programs. Those sanctions hinder the shipment of construction material, including metal. The South Korean Unification Ministry spokesman said the event was a mere “expression of a commitment” to joint projects, adding that construction would depend on “progress on the North’s denuclearization and circumstances concerning sanctions” imposed on the North. Pyongyang and Seoul agreed in October to inaugurate work on reconnecting railways and roads that have been cut since the end of the Korean War in 1953. The project was among the agreements signed earlier this year during a meeting between North Korean leader Kim Jong-un and the South’s President Moon Jae-in. The plan was, however, blocked in September by the US-led United Nations Command, which has controlled all movement through the demilitarized zone (DMZ) that bisects the Korean Peninsula. 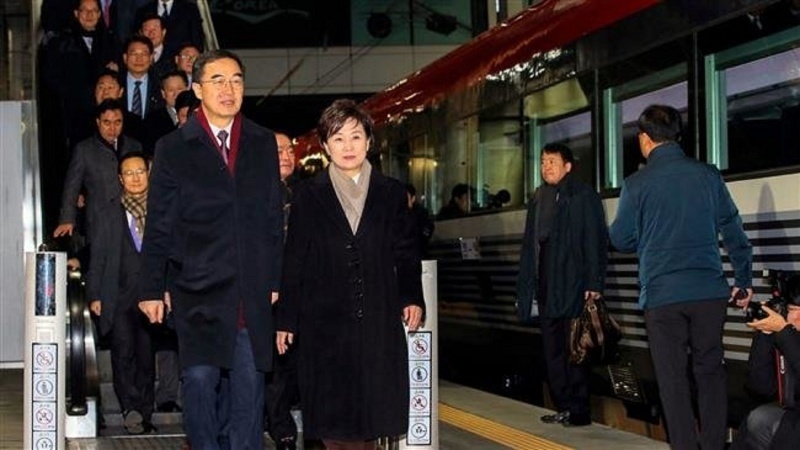 Last month, the UN Security Council finally granted sanctions exemptions to Seoul for a joint survey with Pyongyang for the construction of inter-Korean railways. Diplomacy began between the two Koreas in January. They have advanced their relations fairly quickly since then. But another track of diplomatic engagement — between the US and North Korea — has snagged. The US insists that sanctions on the North must remain in place until it completely gives up its weapons programs. The North says it has already taken good-faith measures but the US has failed to reciprocate any of them. Even without the sanctions, the railway and road project would take time. South Korea’s Transport Minister Kim Hyun-mee said the two sides needed to conduct additional joint surveys and design work for one or two years. “There are a lot of things to do before we actually start construction,” he said.